On February 7, 2019 the first tram test ride took place for the new 6 km Tramway Extension to Piraeus in the Athens urban area. The newly installed tram track covers many contemporary travel needs and provides a durable solution in a crowded and historical city. This turnkey project was awarded to Themeli SA as general contractor. edilon)(sedra contributed with the general design of the system, supply of materials and provision of technical support, training and quality control assistance. The strict requirements for noise and vibration control set by the supervising authority ATTIKO METRO S.A. are met by edilon)(sedra’s Corkelast® Embedded Rail System in combination with edilon)(sedra’s prefabricated floating Slab Track System, in order to overcome the sensitive soil conditions close to the sea side. Over half of the slab track length edilon)(sedra Slab Track Mats are installed, forming a resilient substructure. Throughout the length of the project, there are around 25 switches and crossings included along the prefabricated Slab Track System, which is expected to minimise nuisance to the city’s vivid everyday life and crowded traffic. In addition, this track system allows for relatively shallow excavation depth thus minimising the risk of intervening with the archaeological wealth that lies underground. 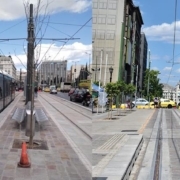 Once all tests are successful, the tramway extension to Piraeus will be released to commercial operation and the tram will be re-introduced in the city after nearly 40 years. 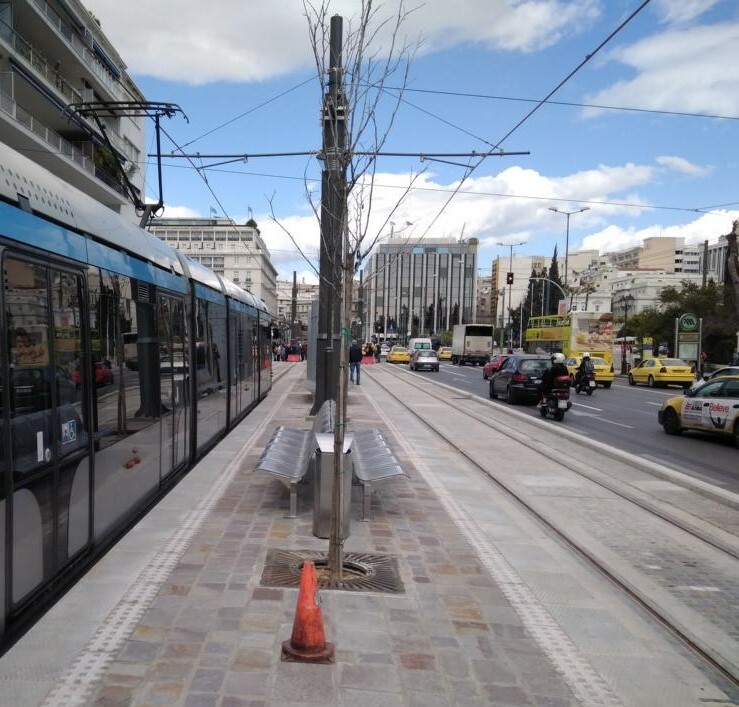 Because the tramway crosses the centre of Piraeus and in some cases the track is located <5 m from buildings an important component of the design was the reduction of noise and vibration. This was accomplished by the use of a continuous rail strip in combination with the rail embedding elastomer Corkelast® VA-60. Stray current protection was created by use of Corkelast® VA-60 and Stray Current Protection Mats for additional bridge protection. The risk in Piraeus as in many parts of Athens is the ever present archaeological findings which if disturbed would result in project delays. Therefore the low prefabricated slab height provided an ideal solution to install a tramway track without disturbing either the services nor the archaeological situation. The track system is designed to accommodate a combination of dedicated tram and mixed road traffic. The Slab Track System was installed in 25 m radius, bridges, turnouts, stations and road elevations. Installation was carried out in temperatures ranging from 5 to 40 degrees Celsius.